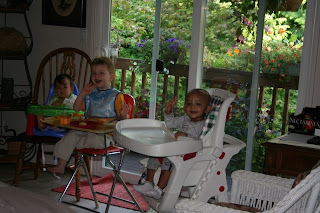 Some of us from RECW planned a get together in our house last Saturday. 9 families attended this party and we had lots of fun. We want to have more of this often and involve more people from RECW who live in Seattle here. 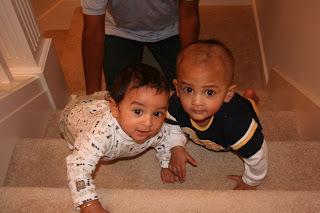 While the elders were busy playing DumbC, Kedaar and SmithaV/Praveen's son Advik had fun racing with each other in climbing stairs. Here are few pictures from the occassion. Kedaar completed 11 months yesterday Oct 8th. He is just one month from his big milestone, 1st birthday. I was just looking at the older posts in this blog where I posted Kedaar's photos when he was born, 1 month old etc. He has grown up so much and it was a lovely experience watching him grow before our eyes. Kedaar completed 6 months in his day care by October 1st week. 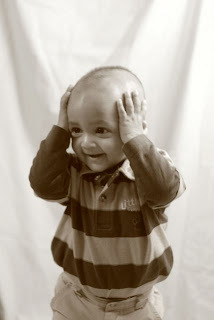 Here is an albumn of Kedaar's photos we took in the past month along with few pictures in his day care. Kedaar's favourite play now a days is playing Peekaboo. He loves watching us doing it and he tries to imitate us immediately by putting hands on his cheeks, head,mouth wherever and plays Peekaboo.